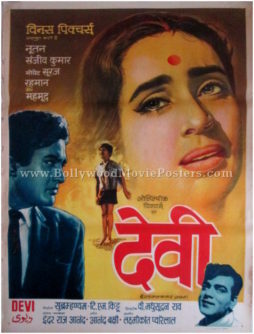 Vintage Bollywood poster for sale of the old Hindi film Devi (1970). 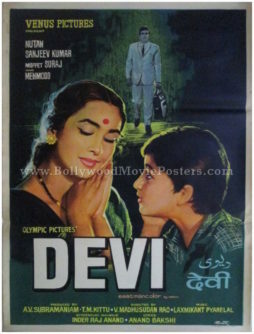 This is an actual surviving vintage Bollywood poster of the 1970 film Devi, which starred Nutan, Sanjeev Kumar & Mehmood in prominent roles. Printed and circulated during the original first release of the film (somewhere in the late 1960s / early 1970s), this vintage Bollywood poster for sale was printed for publicity of the film but never ended up being used. This vintage Bollywood poster for sale was originally designed in hand painted oil on canvas format by a leading movie poster artist, making it highly collectible. A stunning rendition of lead actress Nutan is seen prominently in a large close up portrait. A smaller portrait of actor Sanjeev Kumar is seen painted in a shade of blue on the side, while a smaller tinted rendition of Mehmood appears at the bottom of this vintage Bollywood poster for sale. 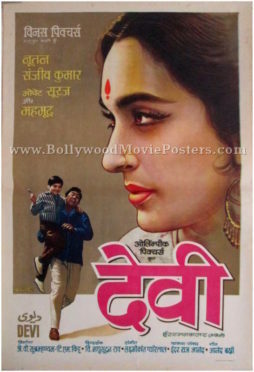 Old Hindi film poster for sale of the Bollywood movie Devi (1970). This is an actual surviving old Hindi film poster for sale of the 1970 film Devi, which starred Nutan, Sanjeev Kumar & Mehmood in prominent roles. Printed and circulated during the original first release of the film (somewhere in the late 1960s / early 1970s), this old Hindi film poster for sale was printed for publicity of the film but never ended up being used. This old Hindi film poster for sale was originally designed in hand painted oil on canvas format by master Bollywood poster designer V.G. Parchure, making it highly collectible. The printed signature of movie poster designer V.G. Parchure in the name of his art studio Pamart is seen on the bottom left of this old Hindi film poster. 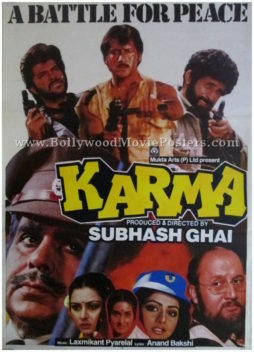 In this old Hindi film poster, Bollywood poster painter V.G. Parchure depicts lead actress Nutan in a stunning side profile portrait. A smaller portrait of actor Sanjeev Kumar holding a child is seen at the bottom. The poster is set against a soothing background with eye catching typography. Hand painted Bollywood movie poster for sale of the super hit Hindi film Main Tulsi Tere Aangan Ki (1978). This is an actual surviving old hand drawn Bollywood poster of the 1978 Hindi movie produced and directed by Raj Khosla that featured Nutan, Vinod Khanna and Asha Parekh in lead roles. Printed and circulated during the original first release of the film in the late 1970s, this old hand drawn Bollywood poster was printed for publicity of the film but never ended up being used. Main Tulsi Tere Aangan Ki won three Filmfare Awards including the Best Movie Award, making this old hand drawn Bollywood poster highly collectible! This old Bollywood movie poster was originally designed in hand painted oil on canvas format by one of the most talented Bollywood poster designers of all time, V.G. Parchure of Pamart Studio fame. This old hand drawn poster bears the printed signature of Bollywood poster painter V.G. Parchure in the name of his art studio, i.e. Pamart on the top right hand corner. Bollywood poster painter Parchure’s mastery over the paint brush is clearly seen in this spectacular old Bollywood poster. Highly realistic hand painted portraits of actresses Nutan and Asha Parekh are seen prominently on the center and right respectively. A stunning side profile of actor Vinod Khanna painted in red with brilliant highlights is seen on the left of this hand drawn Bollywood poster. Actor Vijay Anand is seen in a smaller hand painted portrait in the background overlapping Asha Parekh, suggesting his affection for her. 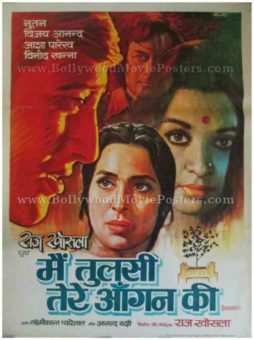 A small holy basil (Tulsi) plant is seen at the bottom of this hand drawn Bollywood poster, visually describing the title of the film. The title song of the film “Main Tulsi Tere Aangan Ki” sung by Lata Mangeshkar is fondly remembered and played till today. 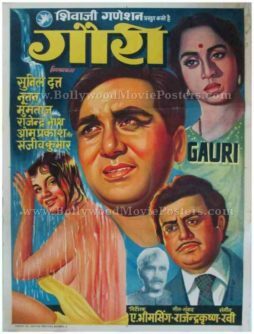 Old Indian movie poster for sale of the classic Hindi film Gauri (1968). This is an actual surviving vintage Indian poster for sale of the 1968 Hindi film that starred Sunil Dutt, Nutan, Mumtaz and Sanjeev Kumar in prominent roles. Printed and circulated during the original first release of the film (somewhere in the late 1960s), this old Indian movie poster for sale was designed for publicity of the film but never ended up being used. This old Indian poster was originally designed on canvas using oil paints by noted Bollywood poster painter Manohar. His printed signature is seen on the bottom right hand corner of this vintage Indian poster for sale. Quirky hand painted portraits of the lead actors Sunil Dutt, Nutan, Mumtaz and Sanjeev Kumar are seen in this old Indian poster. A black and white photographic still of supporting actor Om Prakash is seen at the bottom. Actress Mumtaz appears bathing in a revealing risqué portrait. Considering the time period the film was released in, this old Indian film poster features a very daring and bold design. 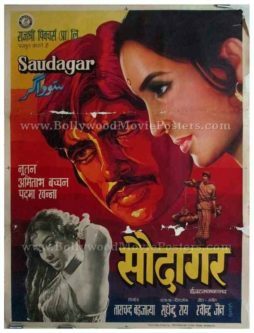 Rare vintage Bollywood movie poster of the Hindi film, Saudagar (1973) for sale. This is an actual surviving old Amitabh movie poster of the 1973 film that featured the greatest superstar of Indian cinema in the lead role along with actress Nutan. Although Saudagar didn’t do well commercially, it was selected as the Indian entry for the Best Foreign Language Film at the 46th Academy Awards, making this poster highly collectible. Printed and circulated during the original first release run of the film (somewhere in the early 1970s), this Amitabh Bachchan old movie poster was originally designed for publicity of the film but never ended up being used. This hand painted Bollywood poster was originally designed on canvas by one of the finest Bollywood poster painters of all time, C Mohan, owner of Studio C Mohan. His printed signature is seen in blue on the bottom right hand corner of the poster. This beautiful old Amitabh movie poster is a striking example of C Mohan’s mastery with the paintbrush. Flawlessly executed, this hand painted Bollywood poster features a stunning portrait of superstar Amitabh Bachchan prominently at the center in red. A beautiful portrait of actress Nutan is seen alongside. A smaller photographic still of superstar Amitabh Bachchan is seen underneath the two hand painted portraits. A black and white still of actress Padma Khanna in a sensuous pose is seen at the bottom. This vintage original Bollywood poster has been graded as ★ As Is due to small missing pieces seen clearly in the adjoining photograph. Although these imperfections do not majorly affect the display value of the poster, please study the image carefully before placing an order. Very rare original vintage Bollywood poster of the hit Raj Kapoor film, Chhalia (1960) for sale. 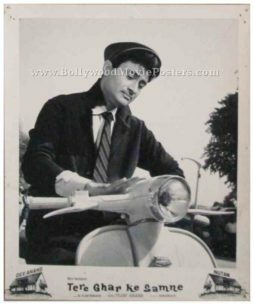 This is an actual surviving old publicity poster of the 1960 classic Hindi film that featured the “show man” of Indian cinema, Raj Kapoor in the lead role. Chhalia is the hit Raj Kapoor film that featured the timeless classic, “Dum Dum Diga Diga” sung by Mukesh. 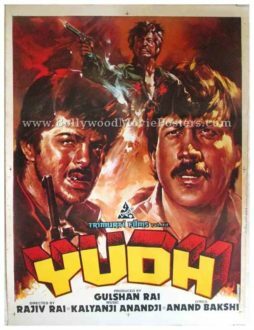 Further, Chhalia marked the directorial debut of Bollywood’s highly acclaimed filmmaker, Manmohan Desai, making this poster highly collectible. 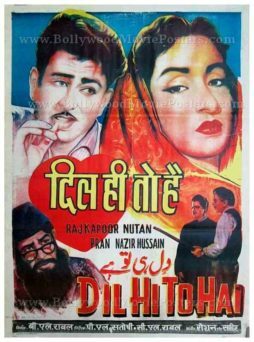 Printed and circulated in the early 1960s during the first release of the film, this very rare Raj Kapoor movie poster was originally designed for publicity of the film but never ended up being used. This beautifully hand painted Bollywood poster features a stunning portrait of Raj Kapoor lying down at the bottom. 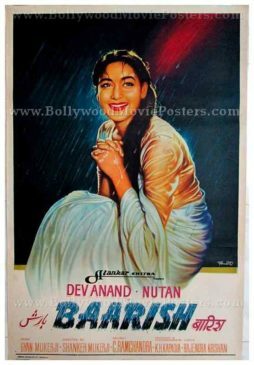 The object of his affection, actress Nutan is seen in a close up portrait on the left of the poster. Designed and hand painted by one of the greatest and most influential Bollywood movie poster artists in the history of Indian cinema, DR Bhosle, this poster is an extremely rare surviving piece. The signature of D.R. Bhosle is clearly seen at the bottom of Raj Kapoor’s portrait. 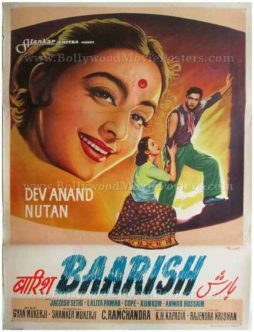 This vintage original Bollywood poster has its title and credits written completely in English with a translation of the title in Devanagari Hindi at the top. This rare original first print Bollywood poster has been painstakingly restored back to display condition using some amount of taping at the back to repair a few cracks and tears/rips. As evident from the photograph, tiny pieces have gone missing along a couple of cracks along the lower fold of the poster. Due to the same, this poster has been graded as ★ As Is. 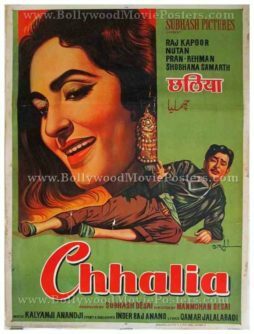 Chhalia is a 1960 Bollywood film starring the “Show Man” of Indian cinema, Raj Kapoor opposite Nutan. The story of the film is believed to be adapted from “White Nights” written by Fyodor Dostoyevsky. Chhalia was shot in black and white. The film’s music went on to become a rage throughout the nation. Songs from the film, particularly “Dum Dum Diga Diga” sung by Mukesh are played till today. Minimal retro Bollywood poster of the old Hindi film Milan (1967) for sale. This is an actual surviving Bollywood movie poster of the award winning 1967 classic Hindi film, which featured Sunil Dutt and Nutan in lead roles. Printed and circulated a few years after the first release of the film (somewhere in the 1970s), this retro Bollywood movie poster was designed for publicity of the re-release of the film but never ended up being used. 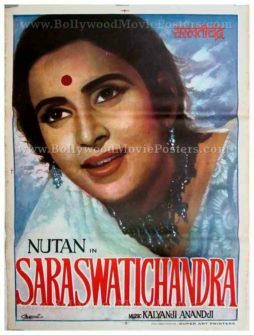 This old handmade Bollywood movie poster features a large photographic still of beautiful Bollywood actress Nutan in the background. Lead actor Sunil Dutt is seen steering a boat in the foreground in a smaller still photo. 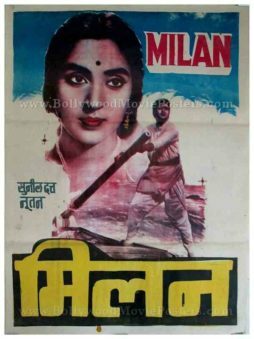 Milan is a 1967 hit Hindi film starring Sunil Dutt, Nutan & Jamuna. The film won accolades for its music composed by Laxmikant Pyarelal. It is fondly remembered as one of the earliest films in Indian cinema to weave a story around the subject of reincarnation. Beautiful hand painted old Bollywood movie poster of the hit Hindi film Saraswatichandra (1968) for sale. Saraswatichandra has the unique distinction of being the last Hindi film in Indian cinema to be made in black and white. Printed and circulated several years after the first release of the film (somewhere in the 1980s/1990s), this movie poster was originally designed for publicity of the film but never ended up being used. This poster was originally designed on a hand painted canvas making it highly collectible. In the poster, noted Bollywood poster artist C Bakshi captures the lead actress Nutan in a spectacular hand drawn portrait. Typography used in this poster is completely in English, except for a translated title in Devanagari Hindi. Saraswatichandra is a hit Hindi film released in 1968 . It starred Nutan and Manish in lead roles and was directed by Govind Saraiya. The film was based on Saraswatichandra, a famous Gujarati novel authored by Govardhanram Madhavram Tripathi. The film won the National Film Awards in the Best Cinematography and Best Music Director categories. Song like “Chandan sa badan” and “O main to bhool chali babul ka desh” sung by Lata Mangeshkar went on to become cult classics and are still remembered today. 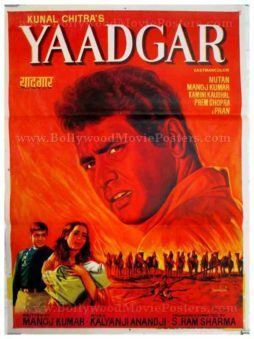 Beautiful hand drawn vintage Bollywood movie poster of the Hindi film Yaadgaar (1970) for sale. This is an actual surviving poster of the 1970 film starring Manoj Kumar and Nutan. Printed and circulated somewhere during the 1970s, this quirky, hand painted old Bollywood movie poster was originally designed for publicity of the film but never ended up being used. This poster was originally designed on a hand drawn canvas by one of the most sought after Bollywood poster design studios in Mumbai, called Loombart, making it highly collectible. The hand drawn Bollywood poster features the film’s leading couple surrounded by bandits on camels and the villain holding a whip. 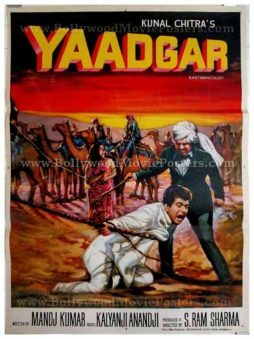 Yaadgaar (Memorable) is a 1970 Hindi film starring Manoj Kumar, also known as Bharat Kumar for all the patriotic roles he appeared in during his career in Indian cinema. This Bollywood film also stars Nutan, Pran, Prem Chopra, Madan Puri and Kamini Kaushal. Beautiful hand drawn old movie poster of the Hindi film Yaadgaar (1970) for sale. This is an actual surviving poster of the 1970 film starring Manoj Kumar and Nutan. Printed and circulated somewhere during the 1970s, this quirky, hand drawn old Bollywood movie poster was originally designed for publicity of the film but never ended up being used. This poster was originally designed on a hand painted canvas by a leading art studio in Bombay, making it very collectible. The hand drawn poster features the film’s three essential characters, the hero, heroine and the villain against a fiery orange background.